On Saturday, January 26, 2019, major protests were held by people from various strata in Tehran, Kermanshah, Qom, and Abadan. Women played a prominent role throughout these protests. In Tehran, a group of law graduates held a protest rally in front of the Bar Association building in protest to the unemployment of jurists. 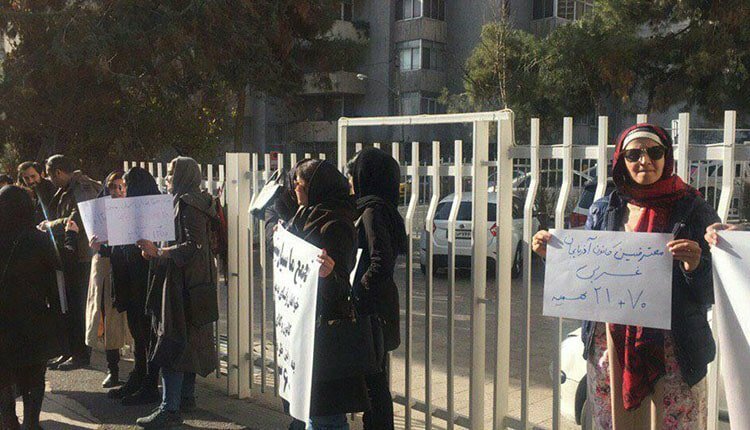 Furthermore, a group of men and women defrauded by the Gold Samen Website once again gathered in front of the Public Prosecutor’s Office in Tehran. They have been protesting for several consecutive days, but have not yet received any responses to their demands. Also, a large group of buyers of registered vehicles from the Saipa and Iran Khodro automobile companies gathered in front of the Ministry of Industry, Mine and Trade in Tehran, in protest to the high prices of the vehicles, lack of delivery of their purchased cars, and the failure to respond to their demands. Women’s prominent role was noticeable in the protest as they chanted, “Iran Khodro and Saipa are affiliated with mafia”. In the wake of the massive protests in previous days across Iran, a number of teachers and educators in Kermanshah also gathered on Saturday, January 26, 2019, in protest against the nonpayment of their salaries. Women displayed a prominent role at the gathering, where teachers and educators also called for the release of imprisoned teachers. On Saturday, January 26, 2019, a group of civil activists also participated in the 40th day of the death of political prisoner Vahid Sayadi Nasiri, commemorating him at his grave in Qom. Vahid Sayadi Nasiri, was a human rights activist and political prisoner who was imprisoned in Qom’s central prison. He died on Wednesday, December 12, 2018, after a 60-day hunger strike and lack of medical treatment at the Beheshti Hospital in Qom. Earlier, on Thursday, January 24, 2019, the families of market vendors in Abadan held a protest rally and demanded their rights. Between March to December 2018, women participated in at least 831 protest movements in Iran.